Leonardo Da Vinci was one of the greatest talents to emerge from the Italian Renaissance. Not only was he hugely influential as an artist and sculptor, he was an inventor, mathematician and engineer. Of course, he is most remembered for the Mona Lisa, The Last Supper and the Vitruvian Man. His sketches of prototype helicopters, bicycle, parachutes, a machine gun and tank were considered ahead of his time, 500 years before they were invented. He wrote about anatomy and geology. His focus on anatomy was in order to paint the human body more accurately. The mixture of science and art is evident in his works, and if it wasn’t for all his artwork which survives today, his legacy could have been as a scientist rather than a painter. Leonardo da Vinci was born on 15 April 1452 near the Tuscan town of Vinci. He was the apprentice of painter and sculptor Andrea del Verrocchio in Florence, and in 1478 became an independent master. In 1483, he moved to Milan to work for the ruling Sforza family as an engineer, sculptor, painter and architect. This was when he produced the mural of ‘The Last Supper’ in the refectory of the Convent Santa Marie delle Grazie. Here you will find The Last Supper, one of Italy’s most visited and well-known paintings – now a busy tourist attraction. Even though the Last Supper is on a wall, it is not a fresco. Frescos are paintings on wet plaster. Da Vinci rejected this technique as it requires the painter to rush to finish their work before the plaster had dried. In fact, da Vinci invented his own technique to paint on stone walls by priming the walls beforehand. This gave him all the time he needed to paint all the fine detail. His painting experiment didn’t work out in the long term and the paint began to flake off 50 years later, meaning da Vinic’s original brush strokes have long gone. The ‘Last Supper’ has continually been restored over the years with an extensive restoration in 1980 which took 19 years. Tickets should be purchased in advance, available online (up to 2 months prior). If you struggle to find tickets for the dates you require, it is often wise to check with your hotel – they often buy tickets of their own for guests. The painting is housed in the ‘refectory’ of the convent of Santa Maria delle Grazie, a UNESCO protected site. Hall 15 is where you will find da Vinci’s works at the Uffizi in Florence. His ‘Annunciation’, ‘Adoration of the Magi‘ and even a self-portrait can be found in this extensive collection. The ‘Adoration of the Magi’ is an unfinished work of da Vinci and is currently under restoration. The ‘Annunciation’ is one of da Vinci’s early paintings and complete with the help of his master, Andrea del Verricchio. The subject of the painting comes from Luke 1. 26-29, and depicts the angel Gabriel sent by God to announce to Mary that she would miraculously conceive and give birth to a son, named Jesus, who would be ‘the Son of God’. When viewing this painting – look closely at the angel’s wings. Da Vinci’ s attention to detail is evident in the anatomically correct wings which are believed to based on those of a real bird. Don’t miss da Vinci’s sketches while visiting the Uffizi. They are housed in the print room on the second floor. Not only will you find sketches by da Vinci, but also Michaelangelo, Botticelli and Raffaello. To avoid the queues that form daily outside the Uffizi, it is wise to book tickets in advance. 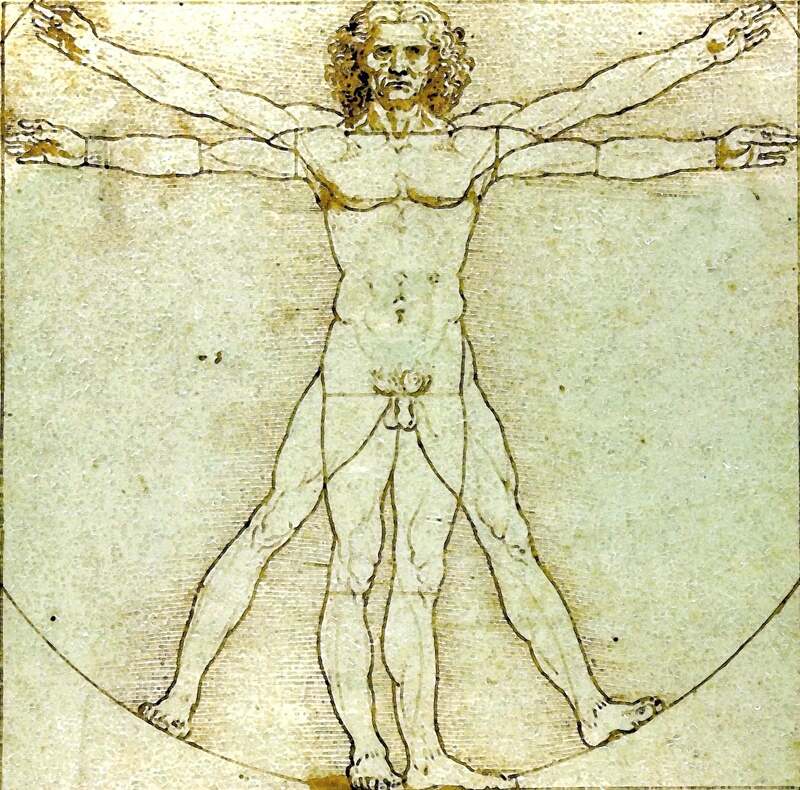 Another iconic work from da Vinci, the Vitruvian Man is kept at The Gallerie dell’Accademia in Venice. However, because of its scientific significance and fragility, the original sketch is kept under lock and key and rarely gets an outing. The Vitruvian Man explores the human body in an artistic and scientific way and acts as a scientific model for the rest of the artistic world. Da Vinci studied the writings of Roman architect Vitruvius which explored the proportions of the human body. Da Vinci believed these patterns should be repeated in architecture and often sought to find similar proportions in the natural world. There was a model used for the sketch who remains a mystery. It is thought that the sketch is da Vinci’s vision of the ‘ideal’ male. It is not a portrait but rather da Vinci’s depiction of the male form based on mathematics. In the small town of Vinci near Florence, Leonardo da Vinci was born in a farmhouse just outside the village, an illegitimate son of a local lawyer. 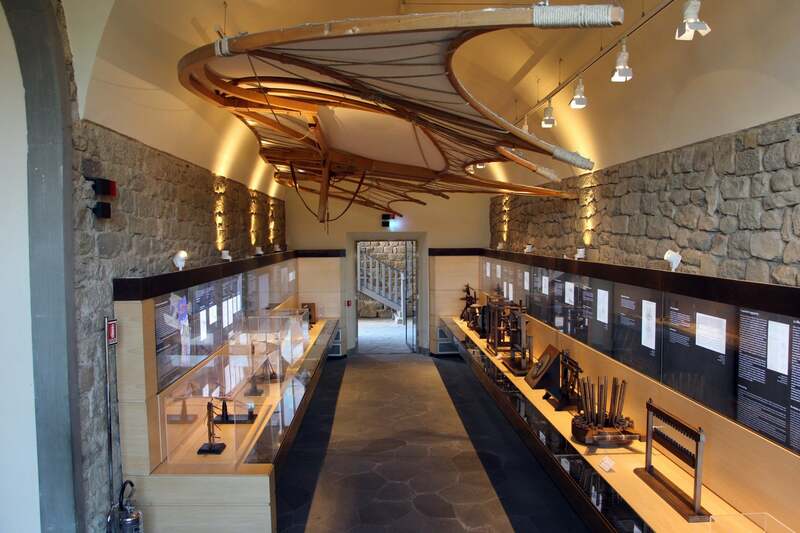 Museo Leonardiano is dedicated to his scientific discoveries and inventions. The museum brings to life many of da Vinci’s innovative designs in an exhibition of 60 models. You can also visit the farmhouse where he was born as part of your da Vinci trail.